ENGINEERING. PRACTICE. POLICY. 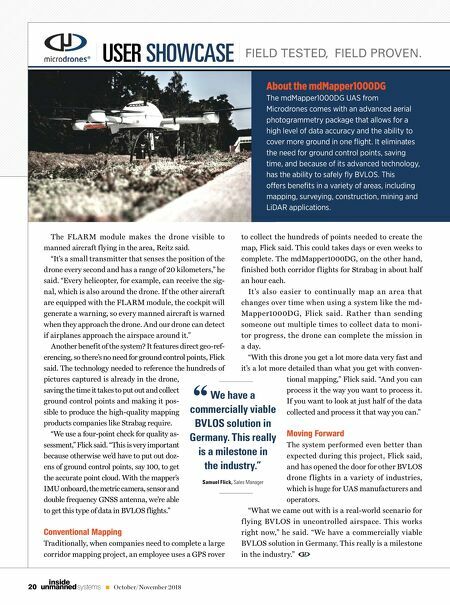 21 October/November 2018 unmanned systems inside Above: Nuro announced its partnership with Kroger in June. Testing began in August, with the vehicles making their first deliveries in Scottsdale, Arizona. manually and don't have sensors inside recording data. Other companies are actually test- ing autonomous vehicles in real-world situations. Nuro announced plans to deliver groceries for Kroger's Fry's Food division in Scottsdale, Arizona. via its self-driving f leet of Priuses in August, and AutoX began working with fellow startup GrubMarket to begin testing its self-driving vehicle in August as well. Udelv formed its first partnership with Delivery Guys and Draeger's Markets in January, and before making the Oklahoma an- nouncement in September, completed more than 700 deliveries for a variety of partners, including San Francisco- based f lorists, restaurants, auto parts warehouses and pharmacies. AutoX has been testing two differ- ent models in San Jose, California, Chief Operating Officer Jewel Li said. The first involves a self-driving car that delivers orders to customers. The sec- ond is a model that would allow con- sumers to buy items directly from a shelf set up in the vehicle, and is what Li describes as a "completely new shop- ping experience." "Our mission is to make grocery de- livery more convenient and affordable with improved customer experience," Li said. "We plan to set the average delivery fee to be as low as $2.50 per order, significantly lower than a hu- man driver." For now, a safety operator must be in the vehicles for all testing, but compa- ny leaders from both the autonomous vehicle and retail industries hope to prove to regulators and the public that the vehicles are safe enough to travel with only the items they're delivering. 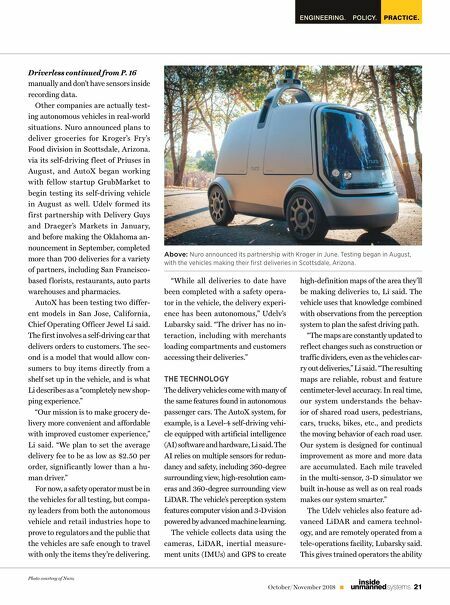 Driverless continued from P. 16 "While all deliveries to date have been completed with a safety opera- tor in the vehicle, the delivery experi- ence has been autonomous," Udelv's Lubarsky said. "The driver has no in- teraction, including with merchants loading compartments and customers accessing their deliveries." THE TECHNOLOGY The delivery vehicles come with many of the same features found in autonomous passenger cars. The AutoX system, for example, is a Level-4 self-driving vehi- cle equipped with artificial intelligence (AI) software and hardware, Li said. The AI relies on multiple sensors for redun- dancy and safety, including 360-degree surrounding view, high-resolution cam- eras and 360-degree surrounding view LiDAR. The vehicle's perception system features computer vision and 3-D vision powered by advanced machine learning. The vehicle collects data using the cameras, LiDAR, inertial measure- ment units (IMUs) and GPS to create high-definition maps of the area they'll be making deliveries to, Li said. The vehicle uses that knowledge combined with observations from the perception system to plan the safest driving path. "The maps are constantly updated to reflect changes such as construction or traffic dividers, even as the vehicles car- ry out deliveries," Li said. "The resulting maps are reliable, robust and feature centimeter-level accuracy. In real time, our system understands the behav- ior of shared road users, pedestrians, cars, trucks, bikes, etc., and predicts the moving behavior of each road user. Our system is designed for continual improvement as more and more data are accumulated. Each mile traveled in the multi-sensor, 3-D simulator we built in-house as well as on real roads makes our system smarter." The Udelv vehicles also feature ad- vanced LiDAR and camera technol- ogy, and are remotely operated from a tele-operations facility, Lubarsky said. This gives trained operators the ability Photo courtesy of Nuro.